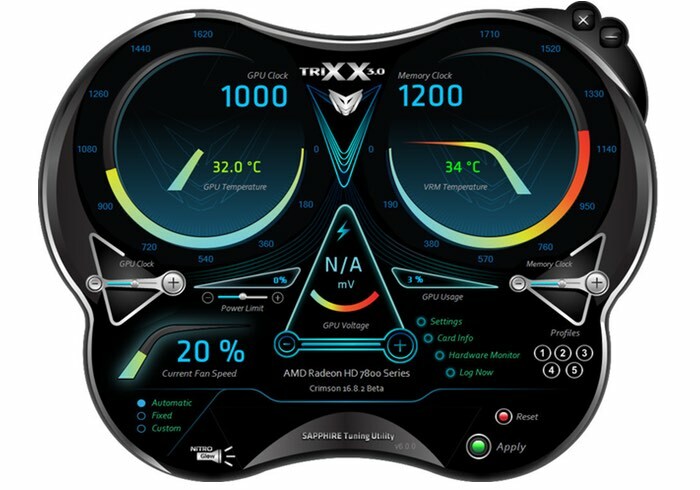 Sapphire as today released a new version of its TriXX Utility graphics card overclocking application in the form of version 6.0.0 which allows users to easily monitor, tweak the clock their graphics cards from an easy to use Windows desktop control panel. The Sapphire TriXX Utility as you might have guessed has been created for Sapphire graphics cards, but is also compatible with a wide variety of other graphics cards created by alternative manufacturers. Since it’s the first major release since AMD launched its new generation “Polaris” GPUs, TriXX supports the Radeon RX 480, RX 470, and RX 460; with special features supported on Sapphire custom-design graphics cards. To begin with, on the new Sapphire NITRO+ series graphics cards, it features the Fan Check function, which tests the health of the fans, and alerts customer support to send replacement fans. It also supports NITRO Glow, letting you customize RGB LED lighting, including 5 lighting presets. Lastly, you can now set up to five profiles for your settings. Jump over to the Sapphire website to download the latest Sapphire TriXX 6.0.0 application via the link below.